A couple of weeks ago, it was our little guy’s first birthday. I can barely wrap my head around the fact that a year has already gone by. People aren’t joking when they say that first year goes by fast. I recall thinking about his first birthday party months ago and wondering what I could serve him for a nice little birthday treat. 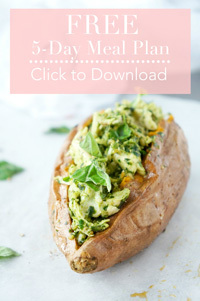 If you’ve been following along with our baby feeding journey, you’ll probably recall that we’ve been trying to feed him a balance of foods (mostly what we’re eating), while limiting sodium intake and the addition of sugar to his diet (you can read more about that in my 5 tips for planning healthy meals for babies post here. So far, any sweetness in his diet has come primarily from fruit. My philosophy is, right now, he doesn’t even know that sugar exists and it doesn’t contribute any nutritional value, so why bother giving it to him? He doesn’t seem to miss it when I don’t incorporate it, so might as well stick to no-added sugar for as long as possible, right? So based on this thought process, I wanted to come up with a recipe for him that didn’t have any added sugar, but still looked and tasted close to the real thing. That’s how these No Sugar-Added Brownie Cupcakes came about. I started by tweaking these 4-ingredient flourless chocolate brownie cups. 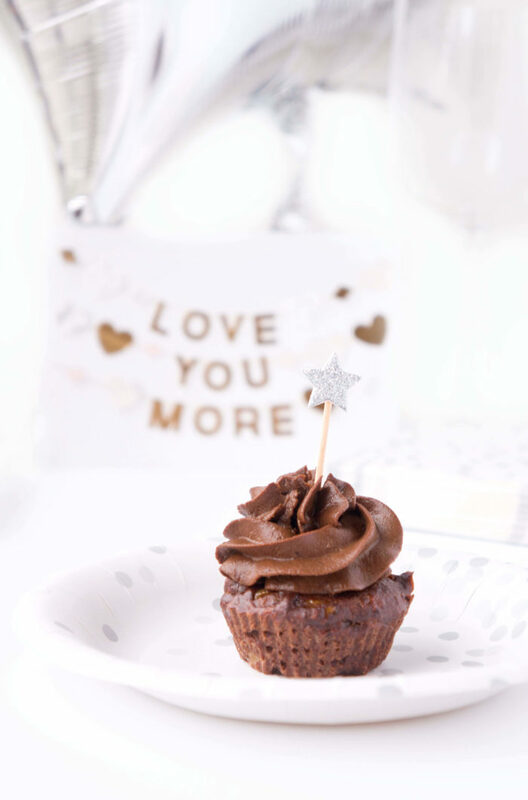 My husband and I really enjoyed these, but I didn’t want to give baby the protein powder since it can be hard on baby’s kidneys so I simply eliminated that ingredient for his cupcakes. Next, I had a vision of creating a chocolate icing that mimicked a buttercream icing since I wanted to pipe it on and make it look extra fancy. After all, everybody needs a fancy treat on their birthday. I’m sure he wouldn’t have cared if I slapped the frosting on the cupcake with a knife, placed it as a blob on his tray, or let him lick it off the floor (seriously, this kid would eat food in any form). But I wanted to make it special for him. No worries though. The ingredients are definitely NOT fancy. They’re actually quite simple. Dates to add that natural sweetness. Unsweetened cocoa powder to incorporate that rich flavour. And a touch of coconut oil and vanilla extract. 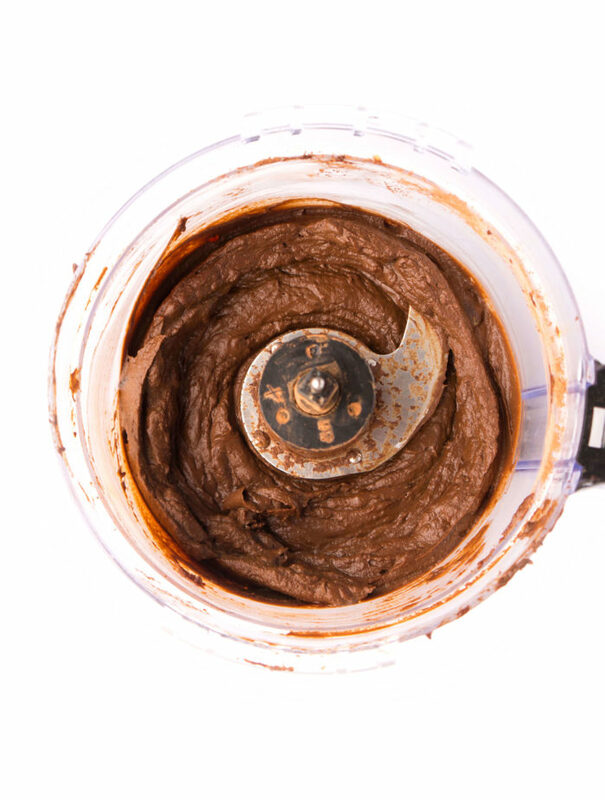 Blend all of these ingredients together and you get a nice creamy, rich chocolate icing that is loaded with healthy fats, vitamin A, C, potassium, fibre and antioxidants. That is one nutrient-packed frosting! 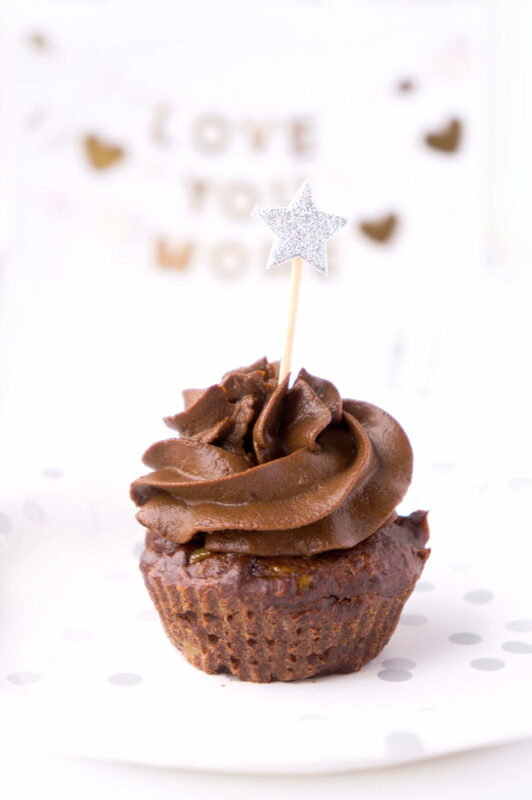 Keep in mind that there is no added sugar so the frosting (or cupcakes for that matter) are not overly sweet. If serving these to adults, you may wish to add a couple tablespoons of maple syrup or desired sweetener to the icing to sweeten it up a bit more, to taste. Personally, my husband and I both thought they were fine just the way they were and baby LOVED them. He had chocolate all over his hands, face, and hair. He basically stuck his hands right into the chocolatey mixture and stuffed it into his face. He looked like a little monster. It was quite cute. Be forewarned — the little ones may need a bath after this fudge-y treat. I recommend using really ripe bananas for the cupcakes as that is the primary ingredient used to sweeten them up. I like to take all of those really overripe bananas that are starting to go brown and store them in the freezer to use for recipes like this one! You’ll want to cook the sweet potato until it’s very soft. You can achieve this by boiling the chopped sweet potato in water, steaming it or roasting it in the oven. Similarly, you’ll want to use a really ripe avocado. Smooth and creamy is the texture we’re going for, so a rock hard avocado probably wouldn’t be the best option for this recipe since, I don’t know about you, but I don’t really want any avocado chunks floating around in my frosting. I always find that the dates that I get are fairly hard and difficult to blend initially, so I like to soak them in boiling water (I just put the kettle on and pour the boiling water in a bowl with the dates) for about 20 minutes or so until they soften up. That way, they’ll be nice and soft and will blend more easily into the frosting mixture. You can top the cupcakes either by smoothing the frosting on with a knife, or if you want to get extra fancy, I like using the Wilton 1M star piping tip and piping bags to pipe the icing on. It might seem intimidating, but it’s really easy. 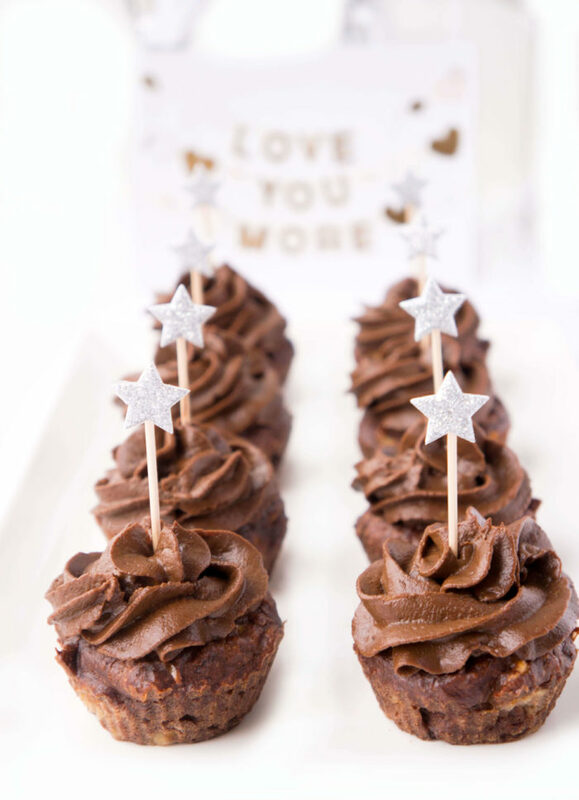 Just insert the tip into the hole in the top of the piping bag, fill up the piping bag with the frosting, give it a squeeze to get the air out, gently moving the frosting into the tip and swirl onto the brownie cupcakes. If you have remaining icing, you can either freeze it in a container or simply use it as a fruit dip, or as a spread on your other favourite baked goodies. I’m sure you won’t have a problem finding a use for this decadent frosting. 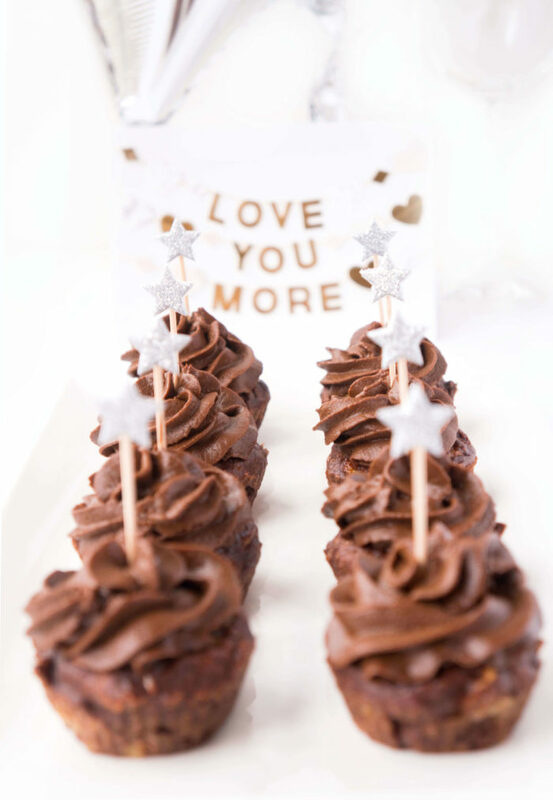 At the end of the day, these brownie chocolate cupcakes make a great healthy treat for babies, children and adults and are especially fun for your little one’s birthday! Preheat oven to 350. Line a muffin tin with silicone baking cups or spray with cooking spray. Mash bananas in a bowl until mostly smooth (there can be some lumps) and stir in the almond butter and cocoa powder until well combined. 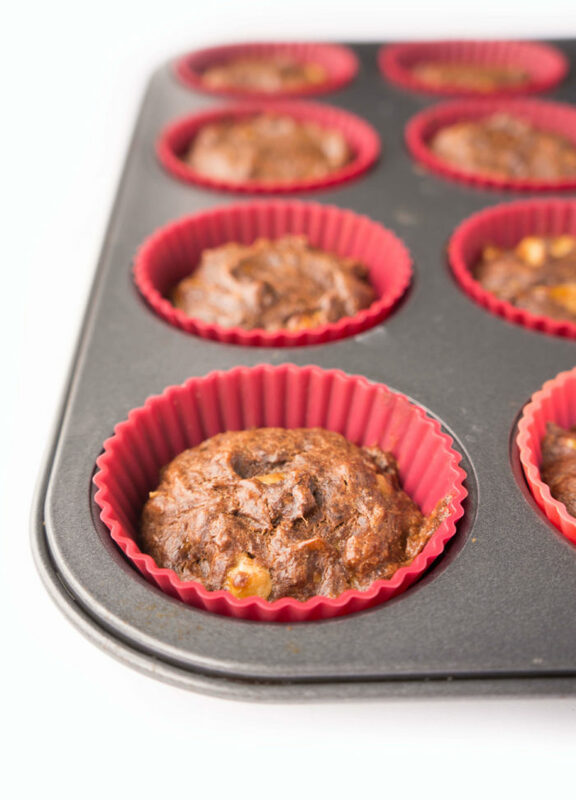 Evenly distribute the mixture among 12 cups in the muffin tin. Bake for about 15 minutes or until brownies are cooked through. Meanwhile, steam or boil the sweet potatoes in a pot until soft. Once cooked, put them in a bowl of ice cold water to cool. Soak the dates in a bowl of boiling water to soften for at least 20 minutes. Combine the sweet potato with the remaining ingredients in a food processor or powerful blender until smooth. Place the frosting in the fridge for about a half an hour to harden a bit. Pipe or spread the frosting onto the cupcakes with a knife. Serve immediately or store in the fridge for up to four days or in the freezer for up to a month. ** These cupcakes are not overly sweet. If serving these to adults, you may wish to add a couple tablespoons of maple syrup or desired sweetener to the icing to sweeten it up a bit more, to taste. Looks so delicious and chocolatey! Can’t wait to try this recipe! Thanks Natalie! Our little guy loved them! For the nut butter, did you do salt and sugar free kind for that as well?